Colour Kodachrome 35mm slide depicts people standing around ruins, likely the likely the Temple of Athena, part of the Parthenon. 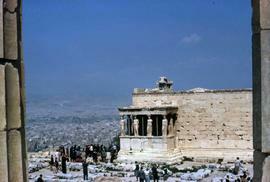 Colour Kodachrome 35mm slide depicts people standing on the wall of a ruin, likely the Parthenon in Athens. 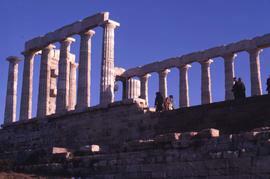 Colour Kodachrome 35mm slide depicts ruins, likely the Parthenon in Athens.